﻿ Cable Crossover Alternatives for Chest & Back | Muscle D Fitness--RIZHAO LANDER SPORTS AND FITNESS INC.
Dumbbell flyes can be done with just a bench and some free weights. Take a dumbbell in each hand and lie flat on a bench, keeping the weights over your shoulders as you position yourself comfortably. 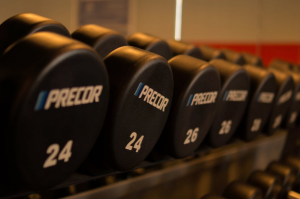 Raise the dumbbells towards the ceiling, with your palms facing inwards and still aligned over your shoulders. Take care not to lock your elbows and slowly lower your arms out to the side, breathing in as you do so. Then return to the previous position with the free weights high above your shoulders (and breathe out). This is one rep – repeat as needed in line with your training goals. Exercise bands can make great cable crossover alternatives since you’re able to position them at almost any height. Start by securing a band around a stable post and then hold both ends whilst facing outwards. Step forward a little so that there’s enough tension in the band to provide resistance. Raise your arms out to the side, whilst keeping your palms facing forwards to get into your starting position. Bring your arms across the chest (keeping them straight) and breathe out as you do so. Hold this stance for a second and then return to the starting position whilst breathing in. Repeat the required number of reps to meet your training needs. Dips provide a fantastic upper body exercise as they recruit muscles in the chest, shoulders, and arms too. A dip machine or rig attachment can provide practical cable crossover alternatives if this is the exercise you use it for most. Position yourself between the parallel bars and hold your body above them with your arms locked. Slowly lower yourself down with your torso tilted forward at a 30° angle to maximally activate the chest. You’ll feel a stretch in your pecs once this happens – from there raise yourself back up to the starting position. Repeat the required number of reps and sets. Seated cable rows activate your trapezius which makes them ideal for developing a wide back. Start by securing a band at a low height around a stable post, then hold both ends whilst you sit facing it. Move back a little so that there’s enough tension in the band to provide resistance. Perform a rowing movement, bringing your hands in line with your chest whilst keeping them as wide as possible (palms down). Return to the starting position and repeat as needed. Lat pulldown machines make decent cable crossover alternatives since they allow multiple grip positions to target different back muscles. Squeeze your shoulder blades together, then pull the bar downwards in line with your collarbone. Slowly return it to the starting position for one rep. To further enhance back muscle recruitment, lean backward at around 30° whilst performing the movement. If you’re looking at cable crossover alternatives, then a functional training machine is your single best option. 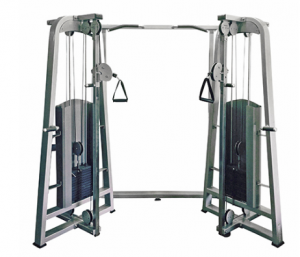 It features a smaller footprint and similar pulley setup, allowing you to do a wide variety of cable-based exercises on the one unit. You can alter the setup to perform flyes, crossovers, rows, and pulldowns, all on just a single machine. You can even do lower body exercises such as leg curls by setting a low pulley height. Or use a bar attachment to replicate the movement of barbell dumbbells. If you’d like to learn more about the best cable crossover alternatives on the market, then get in touch with our friendly team.